Meet the 21 Artists in our May Pottery Sale. Click on the pottery photos to enlarge and see some examples of the artists’ work that will be in our show, and come to the studio on Saturday, May 11th from 10am to 5pm to meet the artists and see their work in person! On your cell? Just click on a photo to read that person’s bio. Questions? Click here to contact us. Want more info about the sale & our giveaway? Click here. Jessica took a Try Clay class and caught the pottery bug. Or, her inner control-freak perfectionist got slapped in the face. And, she wanted more. (I guess that’s something to bring up to my therapist). Teaching at Good Dirt has been an honor and a privilege - being allowed and trusted to be a part of someone’s artistic journey feels like her highest calling (and she promises she doesn’t talk in third person in class). She creates and teaches with Rob any chance she gets. She’s smitten. Still. She, Rob and their immortal poodle, Timothy (who is 24. 24!) live on the East Side. You know, that place in Athens you can’t get anyone to drive to. When I started taking pottery classes I had no idea just how much it would change my life. Like most folks at Good Dirt, I started in a Try Clay class one evening and immediately signed up for a beginner class. Coming from a science background, ceramics feels very much like home, endless opportunities for exploration and experimentation, via form, shape, texture, and glaze. I think that is much of what continues to draw me in. There is almost never a moment when I'm not thinking about new ways to play with clay, itching to get on the wheel, pick up a bottle of slip, or a new carving tool and see what emerges. I am forever grateful to Rob, Jess, Amanda, and the good folks of Good Dirt who have supported me through studio assistantships and allowed me to move into the position of studio manager. I would not have had the courage to purchase my own wheel and kilns to start my own studio. Wet spinning clay on the wheel:slurry sliding through fingers, plastic and stretching, responds to centering and forming. A shape emerges; echoing movement and rhythm of creeks, tides, Sun and Moon. I love this Earth. Stars in the night, the alchemy of the gas kiln fire and celebrating this atmosphere among other potters, sustains my creativity. My current focus is handbuilding tripod mugs. It takes about two hours to make one, so it's very labor-intensive, but I learn something every time I make one, and I enjoy the process. I'm not sure how long my interest in this form will last but I still have a lot of ideas I'd like to try, so I can't see changing course any time soon. I like the idea of doing something over and over until you feel like you really know this one thing very well. Hey everyone! I’m Aubree, and I’m from a small town located in the foothills of the Northeast Georgia mountains. This background really influences where I find my inspiration, namely local flora and mountain scenes! I love making functional but beautiful pieces of pottery, because I like the idea of my art being used and not just being looked at. I enjoy drawing with charcoal when not drawing on clay, which is actually where I got the idea to start drawing on clay in the first place. Other passions include listening to and playing music, throwing around a frisbee, hiking, and old Volkswagens. Amanda has a love for beauty and sees her work in pottery as a way to bring celebration in every day life through handmade, functional objects. She draws inspiration from textures she finds in nature. From the very beginning I have found my inspiration from the wild and nature, this reflects in every piece I make whether it is by the design of the piece or simply through the colors I chose to use in their creation. I like to create simple elegant products that are not only practical in use but whose uniqueness will serve as a talking point around the dining table. Each item is carefully crafted with a little bit of my heart and soul in the hope that it will be enjoyed as much as I have loved making them. I have deep geographic roots and so do my pots. I intend for my connection to place to be present and visible in my pottery. When a future archeologist finds shards from one of my pots, I want them to know from where and when it came. I assume that evidence of the present will be obvious. They’ll be able to name my teachers, see what purchased tools I used and generally read the inevitable influence of the internet and modern life. But I also want them to be able to see the influences of history: the traditional Georgia folk pottery and that of the Creek and Cherokee people who lived here before us. When you handle one of my pots, I want you to feel a connection to me, as well as to this geographically, botanically, historically and culturally rich place we live. I throw my pots with Georgia sourced red clay, and finish them with glazes I created from Georgia minerals and traditional slip glazes fired to stoneware temperatures. I am originally from Atlanta (with strong family roots in rural Georgia), but have lived here in Athens since 1976. I began making pottery in 1999 and have been part of the Good Dirt community off and on ever since. I started working with clay a few years ago. Pottery, for me, is a way to harmonize contradicting ideas. I can connect to the timelessness of pottery while discovering and exploring more modern techniques and styles. I can let my creativity roam free, but the limits of the wheel help me maintain a stable structure to jump off from. I can stay grounded to the earth as I work with the clay, and at the same time, continue to experiment and reach for new ideas. Pottery is so powerful because it’s both calming and rejuvenating. I try to help my students see all of these facets in the beginner wheel classes I teach at Good Dirt. Zoe Daniel is an elementary art teacher by day and potter by night. She studied Scientific Illustration at the University of Georgia but quickly realized she needed to start spreading her love of art to others. Zoe’s pottery is not only meant to be used but to spread awareness. She utilizes her Scientific Illustration chops to create 2 main series in her work. The first explores important pollinators, like bees, in an effort to get people thinking about how much the world needs pollinators to survive. A portion of the profits from this series goes to Greenpeace to help with their bee saving efforts. The second series focuses on National Parks, mainly Yellowstone. She draws animals that are being hurt by policies that are removing protections from Yellowstone. A portion of those profits goes to the National Parks Conservation Association. Since childhood, I have created mostly in painting in mediums such as oil, watercolor, and acrylic. Current painting works are predominantly in the ancient medium of Encaustic, which is a molten mixture of beeswax, tree resin, and pigments. Within my paintings, my style involves painting “organically”, beginning with an idea or concept, but allowing room for the art to unfold naturally, layer upon layer. I draws heavily from my love of the natural world, emotional experiences, and human connections. In 2017, I began adding clay as a medium for creativity and art. Like Encaustic, this tactile medium became an immediate passion for me. As with the rest of my art, this too is inspired most often by nature whether by style, surface work, or glazing. I enjoy every aspect of ceramics I’ve tried thus far from throwing on the wheel to hand building to sculpture. I enjoy the tactile experience, the creative experimentation, the successes, the failures, the patience, the peacefulness. I enjoy everything working with clay has taught me… and yet I have so much more still to learn. Hello! My name is Dianne Watts. I graduated from UGA in December 2017 with a bachelor degree in fine arts. My emphasis was jewelry and metals, but I always had a passion for ceramics.I am so happy to have a place like Good Dirt where I can create again! My love affair with ceramics started about 15 years ago. I watched a potter throw on the wheel and instantly knew that I wanted to learn the art form. Over the years I've learned the tricks of the trade from classes at Good Dirt, and now am teaching the handbuilding Try Clay class on Sunday afternoons. Whether painting designs on mugs or creating intricate patterns on slabs of clay and using them to hand build forms, my focus tends to be on surface decoration. I really enjoy making functional forms and then decorating them to add a little flair. Creating pottery is an art form I have discovered this past year that for me, is a meditation and escape from chaos. I practice making simple, practical forms that clear my mind as I make them and provide a space to rest my eyes and contemplate as I use them. Due to my studies in studio painting/drawing I am drawn to experiments in mark making via slip carving and wax resist. I have recently been introducing narratives and concepts to interact with as the user drinks, eats, or lights a candle out of the piece. I am currently a high school art teacher in Athens where the pace of the day has my head spinning and using technology is a large part of my job. For this reason, love to leave open areas of raw clay and use subtle glazes to let the natural beauty of this collective structure of minerals draw me back to earth. Forever a collector, never a maker. That’s what I believed before I took my first pottery class, but oh, was I wrong! Turns out I love making pottery; everything about the process is exciting, from conception to the making to the glazing, all the way through to the opening of the kiln. You always learn something from the results - sometimes your pot goes on display, and sometimes it goes into the trash, but it always tells you something. We learn from each other, from those of us making pottery now as well as potters who have come before us. Traditional methods are passed down, and around, and they evolve. Potters are generous people, and the studio offers a place to learn together. You learn humility and tenacity and patience, with yourself and with the process. 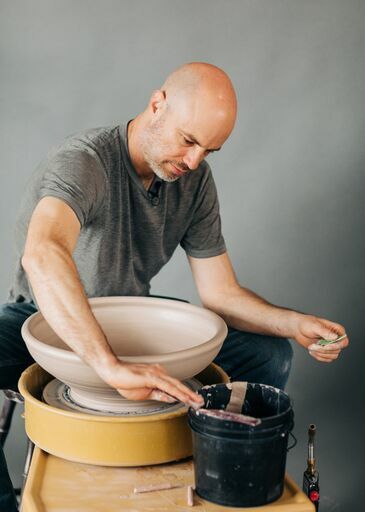 It’s a place of discovery, both in what you can do as well as what your clay can do, and it offers endless joy in the simple making of a single pot. Hey there! I am a book loving, crocheting, potter of a lady who has been doing pottery for about a year and a half. I did a couple of Try Clay classes when I was in school at UGA and caught the clay bug! After that I knew I needed to get my hands dirty more regularly, so I signed up for a class and never looked back. I love making functional pieces for my house and as gifts and I really enjoy experimenting with form. I also make mugs for Normal Books bookshop, where I work as the events director. As someone who is fascinated with the ways I interact with the world around me, pottery has become a passion of mine on both a physical and philosophical level. I believe this carries through, with my pieces reflecting and expressing the process through which they were created. As someone relatively new to pottery I am constantly trying to explore new methods, forms, and materials to further educate myself on the possibilities before me. My goal is for this sense of curiosity to be expressed in my work and for it to act as a reminder that there is always something new to learn about my environment.